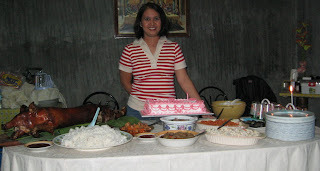 My sister, Alodie, just celebrated her birthday this July 9, 2008. The celebration was just simple and was attended by only family members, well including me, and some close neighbors and friends. There were plenty of children around. Two of my mother’s siblings were also there with their family to celebrate. I arrived in our house around 5:00 in the afternoon. I parked my car near our gate. I could see my sister and her husband, Gigi with two of their children Ann Georgette and Maryse Gwen were already outside the house waiting for me. Sis Alodie waiting for me at the gate. I greeted and kissed her with my gift on my hand. I saw her eyes were smiling, she was just happy that day. We got inside our house and started catching photos. Foods for dinner were prepared at the same time. Dinner was eventually served at around 6:00 in the evening. Everybody was enjoying the meal with letchon de leche, pancit-bihon, ginagmay, nilat-anang karneng baboy, cake, salad, spaghetti, and a lot more.. These foods are actually the Filipino foods we love to prepare on occasions like this..